Not to be confused with true Wood Betony. 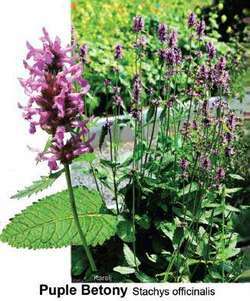 Narrow leaves at base of tall 2ft stick-like stems with cluster of purple flowers on top. Astringent. Slightly bitter (good for digestion) Flowers, leaves and stem used to make tea for anxiety, migraines, gallstones, heartburn, high blood pressure, headache, neuralgia. Strong antioxidant.